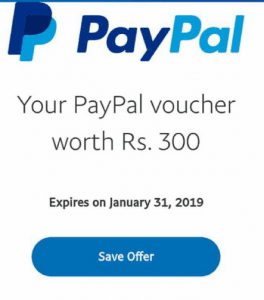 Paypal Again Credited Rs.300 Voucher in Some Paypal user’s Wallet For The Christmas Occasion. Last time Paypal Credited Rs.300 for Diwali Celebration and PayPal is already offering 50% Cashback on Every Paypal Merchant. It isn’t Awesome Offer from Paypal? Some Users may or May not receive the mail for this. I have received mail from PayPal and I found that PayPal credited Rs.200 Voucher to my account. You can also Check using below steps if you got Rs.300 Wallet Cash in Paypal. You can use these credits to make a purchase on the merchants who support Paypal. 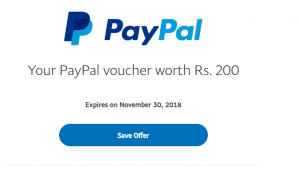 Paypal On this Diwali Crediting Rs.200 Voucher to Some user’s account. You may & May not receive the mail for this. I have received mail from PayPal and I found that PayPal credited Rs.200 Voucher to my account. You can also Check using below steps if you got Rs.200 Wallet Cash in Paypal. You can use these credits to make a purchase on the merchants who support Paypal. 4} Check if You receive the mail from Paypal about This offer. 5} Click on The Link and Now You will need to Save the Offer. 6} On the Screen tap on Save the offer.Once You save the Offer. You are ready to spend Rs.300 on any merchant. 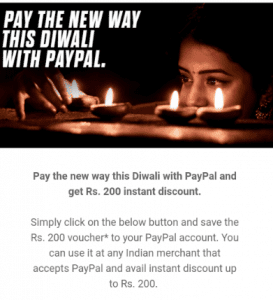 2} Check if You receive the mail from Paypal about Diwali offer. 3} Click on The Link and Now You will need to Save the Offer. 4} On the Screen tap on Save the offer. 5} You can Use these Credits For shopping on merchants which accept paypal. This offer entitles eligible PayPal account holders to receive a discount of INR 200 off an eligible purchase with PayPal. The offer is valid from 29 October to 30 November 2018 (both dates inclusive) (“Offer Period”). Each eligible PayPal account holder may only redeem the offer once during the Offer Period. PayPal shall, at its sole discretion, determine the PayPal account holders who are eligible to redeem this offer. PayPal reserves the sole and absolute right to disqualify any person from redeeming the offer. PayPal reserves the rights to withdraw the offer and/or amend any part of the offer or the Terms and Conditions of the offer at any time without prior notice. PayPal’s decision on all matters relating to the offer and these Terms and Conditions will be final and binding.